For U.S.-based merchants, Online Store now includes a starter version of GoDaddy Online Bookkeeping. Once you connect your Online Store to GoDaddy Online Bookkeeping, all your sales information is updated and organized within the bookkeeping application. That way you know exactly how much you’re selling — and because GoDaddy Online Bookkeeping works on mobile, you can stay up to date while on the go. To learn more, see Frequently asked questions. If you are using U.S. currency, a welcome banner displays across the bottom of your Online Store page. To log in to your new GoDaddy Online Bookkeeping starter account, click Set Up Now. Or go to the Sales menu at the top of your screen and click Go to Bookkeeping. 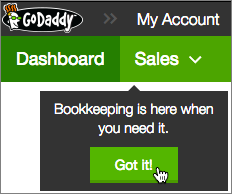 A new browser tab or window opens displaying GoDaddy Online Bookkeeping's Overview page. If you previously enabled Stripe in Online Store, that account data is automatically added to GoDaddy Online Bookkeeping. Note: If you've previously enabled Stripe for payment processing in Online Store, that information will be imported automatically. PayPal information also can be imported, but you'll first need to click Link your PayPal account and follow the instructions. If you want to upgrade to the full version of GoDaddy Online Bookkeeping, click the Taxes menu in GoDaddy Online Bookkeeping. The full version includes additional tax tools, such as estimated tax calculations, Schedule C worksheets and sales tax tracking. It also enables you to create an invoice template, which can be scheduled to be automatically sent to clients. You can easily link other accounts to GoDaddy Online Bookkeeping as well. For more on setting up your account, see Getting Started with Get Paid and Online Bookkeeping. What can I do with GoDaddy Online Bookkeeping? Why was the free version discontinued?